Function 1: health protection function, prevent electromagnetic wave radiation, regulate the body. Fashion jewelry, couple rings. Function 2 (with NFC mobile phone support,but IPhone mobile phone no NFC so not support): mobile phone unlock, information sharing, business cards, etc. Feature 3: IC/ID/NFC chip simulation, can copy the card(entrance guard card, Access card, meal card, elevator card, attendance card)Do not support the bus card, subway card and bank card. Tip: IPhone mobile phone no NFC function, so only apply function 1 and function 3, can not apply function 2. 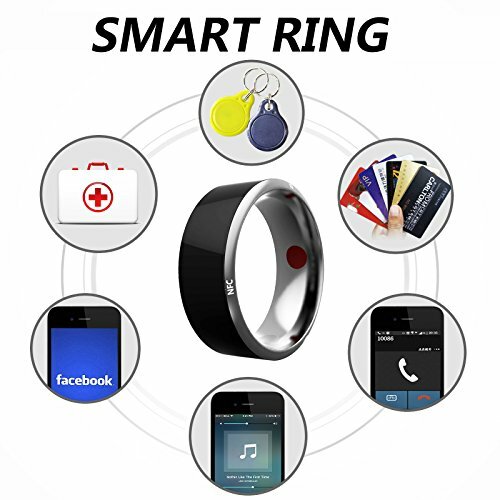 Unlock your Smart phone or tablet Take your NFC enabled phone out of your pocket, slide your hand on the back and the NFC Ring can unlock it. It couldn't be easier!Lock and unlock your door. Want to be able to use your ring to open your house? No problem. Just grab yourself an NFC enabled door lock, install it and your NFC Ring can interact with it. If you have any questions about this product by Newbud, contact us by completing and submitting the form below. If you are looking for a specif part number, please include it with your message.